Is WISE a telescope in space, like Hubble? Yes, only WISE is smaller, sees a different kind of light from what Hubble can see, and will only operate for 7-10 months. What kind of light does WISE see? WISE sees infrared light, which is light beyond the red part of the rainbow invisible to our eyes. If we have a cloudy day, WISE can still see? Yes, it will be above the clouds in orbit around Earth. Where is WISE going to be exploring? Where is it going? WISE will only be going to low Earth orbit (523 km above the ground). It will be exploring the entire Universe by collecting infrared light that comes to us from everywhere in space. How big is this spacecraft? How do you get the wide-field view? The wide-field of view (1.6 times the width of the full moon, 47 arc minutes) comes from a small telescope diameter (40 cm) and large detector arrays. What type of detector arrays are used? How many pixels? There are 4 infrared sensitive detector arrays, each with 1024 X 1024 pixels (1 megapixel array). The near infrared bands (3.4 and 4.6 microns) use Mercury-Cadmium-Telluride (MCT). The mid-infrared bands (12 and 22 microns) use Arsenic-doped Silicon (Si:As). Why do you need to cool the telescope optics and detectors? All objects produce infrared light and the warmer they are the more they produce. The telescope needs to be colder than the objects in space it will observe so that it can see the dim infrared emission from them rather than from the telescope itself. How cold will the components be? The optics will be cooled to less than 20 degrees centigrade above absolute zero (20 Kelvins). The detectors need to be cooled further (particularly the Si:As) to lower noise detection. The Si:As detector will be cooled to less than 8 Kelvins. The MCT detectors operate at higher T, around 32 Kelvin. How will you keep it that cold? We will fill a giant thermos, called a cryostat, with solid hydrogen that surrounds the telescope. How do you get the solid hydrogen in the telescope? Liquid helium is used to cool hydrogen gas down into a solid state. 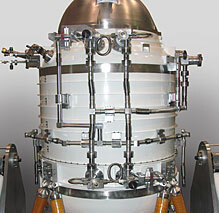 The hydrogen is frozen around an aluminum foam structure inside the cryostat that conducts heat uniformly from the telescope into the solid hydrogen. How long will the coolant last? How does the Sun’s light affect the mission’s design? The solar array will be in constant sunlight generating electricity for the spacecraft, the other parts of the spacecraft illuminated by the Sun will be heated to near 300 K (the average temperature of the Earth). The payload shell will be cooled to 200 K by radiating to deep space. Does the telescope have the same optics as in a visible-light telescope? Not exactly. The reflective optics in WISE are coated aluminum, which is more reflective of infrared wavelengths than the aluminized-glass mirrors used in visible-light telescopes. What is the resolution of the telescope? 6 arc seconds in the near infrared and 12 arc seconds in the mid infrared. Was everything for WISE brought to JPL for integration? No. Much of the integration occurred at Ball Aerospace. When, where, and how will WISE be launched? December 2009. It will launch aboard a Delta II rocket from Vandenberg Airforce base, just to the north of L.A. in Lompoc, CA. Because Vandenberg launch facilities are best suited for launches into polar orbit (orbits that go over Earth’s poles). The rocket’s launch path from Vandenberg will be largely over open ocean away from populated areas. What type of orbit will it be in? The orbit is called Sun-synchronous, because it flies over the dividing line between day and night on Earth, called the terminator. The 523 km circular orbit, inclined by 97.4 degrees, shifts as Earth moves around the Sun so that it can stay over this line. This allows the spacecraft to constantly be in sunlight, so the solar panels will always be pointed at the Sun, providing power to the spacecraft. The spacecraft rotates slowly tail over head once per orbit to keep the telescope always pointing up into space, away from the ground. Does WISE have some propellant to help position itself in a precise orbit? No, WISE will have no propellant aboard. It is placed into orbit by the launch rocket and then will make all pointing adjustments using reaction wheels and torque rods, in combination with star trackers, sun sensors, a magnetometer, and gyroscopes. (Note: the reaction wheels and torque rods maneuver the spacecraft, the rest are sensing elements). For how long will WISE collect data? 6 months, that’s all it takes to survey the entire sky. The cryogen will last 10 months. There is a 1 month in-orbit check out period, and then the 6–month survey. The telescope will likely operate for an additional 3 months. A second pass at half the sky would increase the sensitivity of that part of the survey, find more Near-Earth Asteroids, help determine variability of some objects, and the distance and motion of other nearby objects. Will WISE see objects more than once? Some patch of the sky (e.g. Asteroids) will be observed about a dozen times over about 2 days as they move through the sky along with the telescope’s survey pattern. Objects fixed in the sky will be observed a minimum of 8 times (at the ecliptic equator) over 12 hours before the survey pattern moves past them. Objects at the ecliptic poles will be repeatedly observed every 90 minutes throughout the entire 6 months. A second pass on half of the sky is possible during the extended mission, fixed-sky objects will be seen twice as much and 6 months apart. How often is the data to be downloaded, and how is that done? The spacecraft uses radio antennas to communicate with NASA communication satellites in Earth orbit, called TDRSS, that relay commands and data with ground stations. The operations center will be at JPL and the data processing center will be at IPAC, on the campus of Caltech. The spacecraft speaks to TDRSS several times per day. What can you see with WISE? Is this mission looking for anything in particular? What are some of the science objectives? WISE will survey the whole sky in infrared light, and will produce an all-sky image atlas and catalogue of over 300 million infrared sources. Things of particular interest to the scientists working on WISE are asteroids, the coldest and nearest stars, regions of new star and planet formation, the structure of the Milky Way Galaxy, Ultra-luminous infrared galaxies, and the large scale structure of the Universe. About $300 million dollars, including the Delta-II launch vehicle ($1 per person in the USA). What is the importance of this mission? WISE will find the nearest stars (brown dwarfs), detect near-Earth asteroids, and observe Ultra-luminous infrared galaxies. WISE will fill the gap in all-sky surveys in the mid-infrared. There are several current or upcoming all-sky surveys all across the electromagnetic spectrum, but there is a gap in the infrared coverage from 3-23 microns. WISE fills that gap. WISE will create a catalog of over 300 million sources that will be of interest to future infrared studies, especially the James Webb Space Telescope. How does this improve upon IRAS? Modern infrared detector arrays allow for a huge increase in spatial resolution and a 500 times increase in sensitivity. How is WISE different from SIRTF/Spitzer? Is this a successor? WISE sees similar wavelengths as Spitzer. However, WISE sees the entire sky, but at lower resolution and sensitivity than Spitzer. Spitzer observes very small patches of sky in greater detail. How does this telescope work? The telescope works much like a digital camera. Instead of lenses to create an image it uses mirrors. It collects light with mirrors, uses mirrors, beam splitters, and filters to separate the light into four infrared wavelength bands, and then focuses the four beams onto four different detectors: two made of mercury, cadmium, telluride and two of silicon and arsenic. These four detectors form digital images which are stored on onboard computers and transmitted to the ground via radio communications. How long does a typical NASA mission take from concept to launch? It varies quite a bit. WISE was first proposed in the mid 1990s and progressed into Phase A studies, but was not selected for flight. The program was then proposed again, renamed, and selected for flight in 2002. It was delayed in progressing into construction phases due to budgetary constraints at NASA. It will finally launch in 2009. It’s sister mission, THEMIS, which was also selected as part of the same Explorer call in 2002, launched in early 2007. Big missions like Hubble, Chandra, Spitzer, and JWST can take decades of planning, while smaller missions may take less than a decade to plan and execute. Can some animals see infrared? Yes. Mosquitoes sense infrared to hunt for prey at night. Some reptiles also use infrared to detect heat sources. They don’t see infrared so much as feel it and use the feeling to locate the direction of the source. To some extent human can do this too. Our skin is sensitive to mid-infrared. Why are asteroids seen better in the infrared? Asteroids generally have dark surfaces and do not reflect much visible sunlight. They do absorb the sunlight that falls on them. This heats them up and they glow in the infrared (heat). Can we see IR from the ground, or do we have to be in space? Some parts of the near infrared spectrum make it through the atmosphere. And a few windows of longer wavelengths make it to the ground as well. But most infrared is absorbed by the atmospheric greenhouse gases, especially water vapor. How high do you have to get up in the atmosphere to see clearly in the infrared? You need to get above most of the water vapor in the atmosphere. There have been planes and balloons fitted with telescopes that go up into the stratosphere to observe infrared. Space is the best place to detect or “see” infrared, however. Is this the first time surveying the sky in the IR? No. IRAS surveyed mid-infrared in the 1980s. COBE/DIRBE surveyed the near infrared in the early 1990s. WISE is a successor to these missions and others, including the Japanese AKARI mission and 2MASS, improving on those surveys by a factor of 500 for IRAS and 500,000 for DIRBE. Is this to observe in the far infrared? No, the wavelengths surveyed will be 3.4, 4.6, 12 and 22 microns: near and mid infrared. Is there IR film you can use in a regular camera? Yes. There is IR film that is usually used with IR filters for the lenses of normal cameras. But they see the very near infrared: 0.7 – 0.9 microns. Visible light is from 0.4 – 0.7 microns. What’s the significance of a star giving off infrared? Any object with a temperature just above absolute zero will give off some kind of infrared. Stars are much hotter and produce plenty of infrared. Stars like the Sun put out most of their light in visible light (not a coincidence). Hotter stars put out most of their light in ultraviolet, while cooler stars put out most of their light in infrared. So infrared is especially useful in studying cool stars (a few hundred to a few thousand degrees Kelvin). They can be either giant or dwarf stars. How many asteroids bigger than 3 km are there in the Solar System? In the main belt there are probably over 200,000 asteroids larger than 3 km, with as many as 1.5 million larger than 1 km. Will WISE look for asteroids or planets in, or forming in, other solar systems, especially Earth-like planets? WISE cannot resolve individual objects in other star systems. But, it can see the dusty debris disks around other stars. These debris disks can be part of planetary formation and result from cometary activity. Characterizing these debris disks will help astronomers better understand the process of planet formation. Huge clouds of dust and gas can become compressed enough that their own self gravity begins to pull them together. They collapse under their own weight. Stars form in the densest regions where gravity is pulling the matter together and the compression of the material heats it up. They spin faster and faster as they get smaller (conserving angular momentum), which forms debris disks about them. Planets or even secondary stars can form in the debris disk. When the core of the star become dense and hot enough nuclear fusion ignites and the star becomes stable. Are brown dwarfs actually stars, and do they have fusion? Brown dwarfs are stars that do not have enough mass to ignite stable fusion reactions. They simply cool and gravitationally contract. Some might say that they are not stars, because stars are defined to have stable nuclear reactions occurring in their core. But others would argue that this only a working definition of a star, which might need revision given the variety of objects out there like brown dwarfs, white dwarfs, neutrons stars, etc. What are we looking at in this IR view of Orion (on the lenticular)? Are some of the stars in this image bigger than the Sun? You are seeing interstellar dust and some heated gas in huge cloud complexes within the Milky Way Galaxy. Most of the stars in the image are cool stars that are nearby. Some of them are giant stars like Betelgeuse. If Betelgeuse were placed in our Solar System at the location of the Sun it would stretch out beyond the orbit of Mars. It is huge. Other stars may be red dwarfs which are smaller than the Sun. How are the galaxies (that WISE will find) different, if at all? WISE will find a special class of galaxies that have tons of star formation occurring. Star formation is often shrouded in dust, so little visible light gets out. But the heated dust radiates all of the energy of the stars away in infrared light. These galaxies are called Ultra-luminous infrared galaxies (ULIRGs). They often appear to be the result of merging galaxies, and also often have supermassive black holes in their cores undergoing Quasar-like activity. Are most of the sources to be studied actually stellar sources? There will be 100,000s of asteroids detected by WISE. But there will be millions of stars and millions of galaxies seen by WISE. How far can you see with this? Will this telescope see to the edge of the Universe? The most luminous galaxies will be seen by WISE and they probably exist more than halfway across the Universe. There may be some quasars visible to WISE from very early in the history of the Universe and hence very far away, possibly near the edge of the cosmic horizon. Does this look for similar objects as with a radio telescope? Yes and no. Radio telescopes can see galaxies and stars. But more often they are used to study radio light emitted from gas in the Cosmos. WISE will see the dusty counterpart of much of that gas. Who are the partners on this (what do all those acronyms stand for)? Are you going to have programs for teachers? Yes. We do teacher workshops around the country, will develop lesson plans, will have programs for students to discover asteroids using the WISE data, and much more. Where can I find more educational materials and information from WISE? On our website: http://wise.astro.ucla.edu or http://wise.ssl.berkeley.edu.